Self-compassionate mindfulness is an important component of self-compassion and has been viewed as an essential factor contributing to well-being. With current advances in social neuroscience highlighting the neurogenetic basis of human behaviors, the present study aimed to investigate the neurogenetic foundation of self-compassionate mindfulness. Of particular interest is OXTR rs53576, which is responsible for affiliation and has been suggested as the potential genetic mechanism underlying self-compassionate mindfulness. We performed a resting-state fMRI and used a graph theory-based analysis in a sample of genotyped healthy college students. The Self-Compassion Scale-Short Form (SCS-SF) was used to assess the trait of self-compassion. G allele carriers of OXTR rs53576 displayed higher self-compassionate mindfulness than did A/A carriers (p = 0.034, ηp2 = 0.086). Moreover, the graphic metric of the degree in regions in the empathy network (i.e., the right angular gyrus, medial prefrontal cortex, and anterior cingulate cortex) mediated the association between OXTR rs53576 and self-compassionate mindfulness (95% CI [0.1716, 1.2929]). The graphic metric of the local efficiency in regions of the executive control network (i.e., the right dorsal lateral prefrontal cortex and inferior parietal cortex) also mediated the relationship between OXTR rs53576 and self-compassionate mindfulness (95% CI [0.1792, 1.2866]). 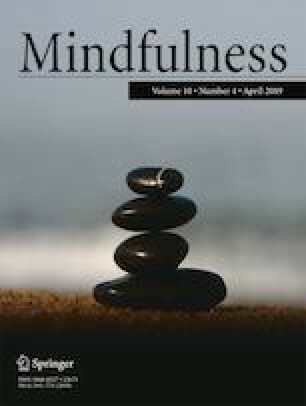 These findings advance our understanding of how self-compassionate mindfulness affects mental health improvements, which is conducive to preventions and interventions aiming to enhance well-being. The online version of this article ( https://doi.org/10.1007/s12671-019-01141-7) contains supplementary material, which is available to authorized users. WYY, LSY, and WX designed the research; YJK collected and analyzed the gene data; ZSQ, GL, YJK, and HYY collected the MRI data; FLL, XXL, and ZH collected the questionnaire data; FLL and ZSQ analyzed the questionnaire data; ZYY, WC, and LSY analyzed the fMRI data; and WYY, FLL, and LSY wrote the manuscript. All authors commented on the manuscript. Yuyin Wang and Linlin Fan contributed equally to this work. This work was supported by the Fundamental Research Funds for the Central Universities grant (Project 16wkpy28), the Science Foundation of Ministry of Education of China (Project 17YJCZH121), the Natural Science Foundation of Guangdong Province (Project 2017A030310553), the National Natural Science Foundation of China (31371129, 31700961, 31800916), and the Research Project of Sun Yat-Sen University (26000-31620003). All experimental procedures conformed to the Declaration of Helsinki and were approved by the local Research Ethics Committee of the Department of Psychology, Sun Yat-sen University. The participants provided written informed consent after the experimental procedures had been fully explained and were reminded of their right to withdraw at any time during the study.